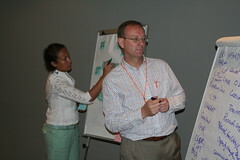 On the second and last day of our Maputo workshop we wanted to to hear back from the groups. We used the fishbowl technique: the group listens in as three participants (sitting in the middle of the circle: in the fishbowl) question each other about what was discussed in their groups. Anyone can move to the middle. Read more about this and other methodologies in the KS toolkit. Although at first somewhat uneasy, later on the Fishbowl worked really well to have a more conversational, more open and more participative summary and digest of the group work. 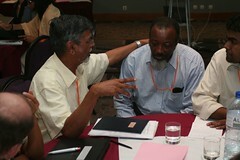 Here are some notes on the Fishbowl session: notes-on-fishbowl-session-maputo. Here are some notes of the last session of the KM group, about capacity building: capacity-building-and-km-exploring-commonalities. 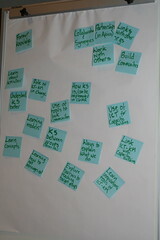 On the first day of the workshop participants thought about their expectations for the workshop -and shared them. Nadia captured what people said on post-it notes and slightly grouped them. This was the result. See more pictures here. How KS can be implemented in the CG? How to make use of strategic opportunities? 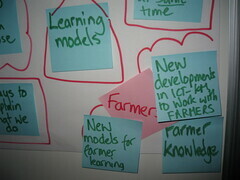 Role of ICT-KM in change? 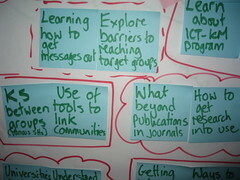 How to get research into use? At the end of the workshop as a kind of evaluation participants were asked to comment on the workshop. This is what they said. Happy to see other methods. 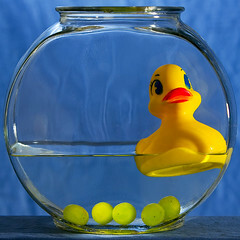 Chat show did not really work, fish bowl was great. Too much technology focus with first presentation. Output through WP -brilliant. 2 sides of the coin. technology and new young generation. positive about bringing universities to KM community. Content versus IT. Information is not Knowledge. Welcoming idea of CLO. More structuralized collaboration between KM and capacity building. Great idea to merge Agric Ed. &KM connection with change process. work systematically together. Reminded about what he left behind when moving from a large organisation to a smaller. Great diversity (org & geographically) a lot of new ideas. Interesting example of social reporting. At several occassions during the KM, E & L Workshop in Maputo, we split up in three groups: Knowledge Management (mostly from a CGIAR perspective), communicating and learning with rural communities, and Education (how to reform African universities). In each group, notes were taken by “reporters”. Herewith we share some of these notes. Action oriented approach: What opportunities for collaboration? -How to ensure knowledge generated is part of Knowledge sharing web? -How do we capture the needs/demands/ of the beneficiaries? -how do we capture the information and resources that can address the needs of the beneficiaries. Check institutions with best practices in KM to adopt. Promote cost sharing among stakeholders. 2. Review and identify policies ^policy frameworks, institutional systems, resources and structures neede to perform university fuctions optimally. Involve CG centres & research institutes to ensure quality in research to gain adequate competencies by the learners. 3. Review teaching and learning practices to meet expected learning outcomes. 4. Review the KM systems of instittions in order to identiffy best practices to customise to our environment. Develop criteria for our best practices. Follow up of decisions taken: what mechanisms. timelines. Validation. Need to develop an investment agenda by the universities. How old model relates to new technologies. Organizations need to change their values, structure. 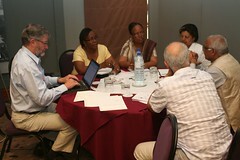 Part of their evaluation should include what they contribute to the communities’ progress and development. See more notes on the first session here. what is KM within CG. where does it stop? at the organizational boundaries of CG? Q: Are the problems faced by CG also faced by others? we would be wanting to give generic recommendations. See also Enrica’s post on this session.